In this article, we will explore how we can configure SharePoint Server 2019 home page and how it is beneficial to be able to access the information easily. SharePoint provides the flexibility to set up sites based on business scenarios and technical architecture by defining a site structure. The site structure can span setting up web applications and creating site collections to the sub sites under it. As a user we are part of multiple sites with a variety of permission sets. We contribute content to multiple sites, and follow or like content from others. There are a few sites or links frequently used by us. All this information should be seen in one place for better collaboration. 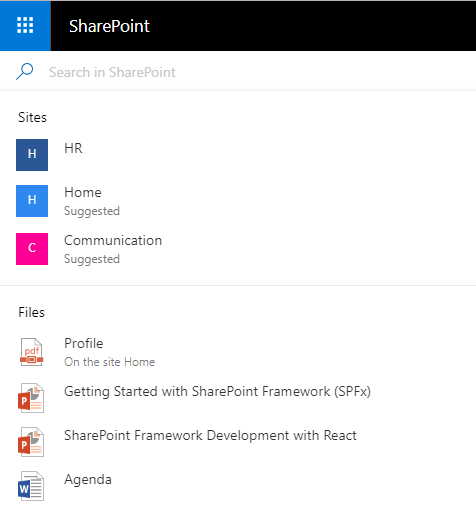 SharePoint 2019 helps co-locate the information together at one place called the home page. SharePoint Home is a new feature of SharePoint server 2019. Home is a modern page which provides personalized experience to the users. It helps users find and access their content across multiple SharePoint sites, see the activities in the sites they follow, and see the news across sites. SharePoint 2016 (the predecessor to SharePoint on-premises environment) provided the Sites.aspx experience. This experience was limited to show only sites I was following and suggested the sites to follow. SharePoint 2019 replaces the Sites.aspx experience with a Home Page. The site tile in the app launcher is also renamed to SharePoint. 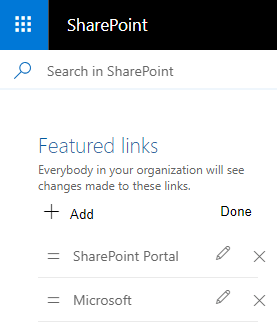 Click SharePoint from App Launcher, or click SharePoint from the ribbon section. When a user clicks in the search box, a list of best-match sites and content is available immediately. All important and useful links can be stored at this centralized location. Administrators of My Site Host site can set the featured links. The featured links are stored in a hidden list at location /Lists/SharePointHomeOrgLinks/AllItems.aspx. Make sure that the default groups are set on My site host. If not set, then set from _layouts/15/permsetup.aspx. SharePoint 2019 Home Page offers Self-Service Site Creation. It helps to create modern Team and Communication sites collections. This section shows the latest news from following and suggested sites. Displays the sites you follow in a tiled manner. Displays the sites you may not have seen yet, but people around you have been active on them. The SharePoint 2019 home page is composed of various functionalities. These require certain services (service applications) in SharePoint to be created and configured. 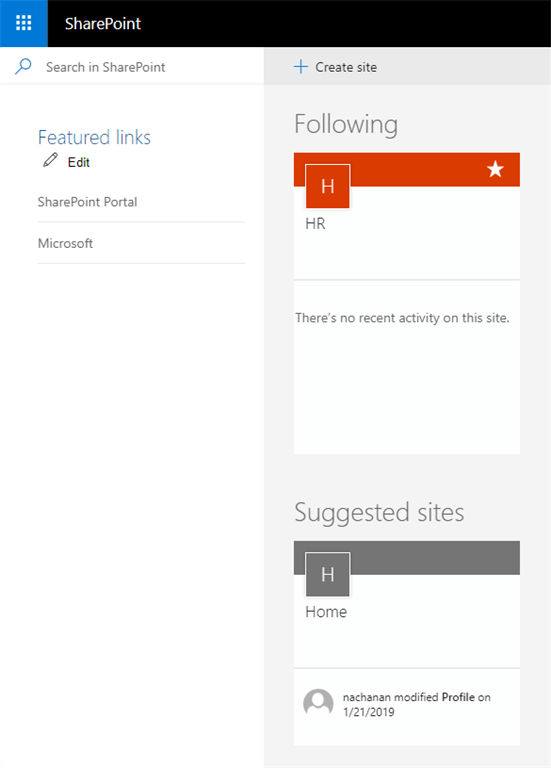 SharePoint home page will look different to each user depending upon his own activities and sites being followed. Each user should have a user profile present in the user profile service application. The search service application should be configured and set to crawl the sites. SharePoint 2019 home page is a new feature and helps the users to display consolidated information about the sites followed by them, suggestions for the sites to follow, news from all followed, and suggested sites in one place.